Adoption of new technologies, expansion of organizations and increase in data usage is driving a new era of applications in the IT World. With Mobile and Social playing a huge role, data is piling up, and in turn changing the way that an organization interacts with its customers, employees and stakeholders. Standard approaches to application development and management will no longer suffice in this dynamic world; agile and innovative solutions are required at lower costs and high output levels. Our team of experts has years of experience and industry know-how to help you achieve what your business needs. Miracle's Application Services Team specializes on various aspects of an application’s life cycle spanning Development, Support and Maintenance, Testing and Quality Assurance, and Modernization of Applications. Our teams are capable of working with multiple application development platforms, which range from standard Microsoft .NET (or) J2EE based applications to custom applications built on top of SAP ERP systems. Our teams are also experts in building applications using internal and external API with both Open Source (or) Commercial Software. Our teams can help support Level 1,2 and 3 activities for any custom (or) off-the-shelf application including Cloud-Based Applications. 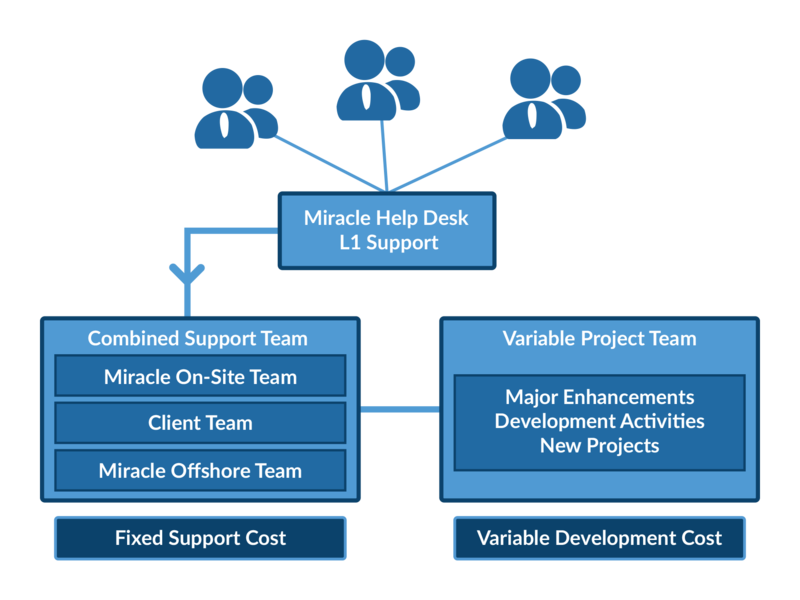 Miracle is the expert in providing 24/7 support through its trusted and proven Hybrid Global Delivery Model based on our multiple Offshore Development Facilities. The Quality and Performance of your applications is critical in enabling high performance for you. At Miracle, we can provide that through our expertise in both Manual and Automated Testing with tools such as HP Quality Center and Selenium. Our expertise spans across SOA Testing, EDI Testing, Application Testing, Cross Browser Testing, Performance Testing and Compatibility Testing for both Mobile and Web Applications. Our Modernization Services include converting Legacy Cobol/Oracle Forms/Fortran/C Based Applications to Java/.NET based applications. For the past 2 decades Miracle has helped enterprises migrate to high-performance platforms, enabling them to take the next step towards growing their business. Our teams are even capable of migrating Legacy Systems to Packaged Applications with some parts being migrated to a Rules Management System (or) to a federated approach across multiple platforms using Integration as the glue. We have also been able to expose the Mainframe/Legacy Environment as web services to modern technologies such as Mobile and Web Applications. Any organization needs a strong foundation of their business process implementations in order for them to be able to sustain in the industry and increase ROI. With the ever growing technologies and available design, architectural and implementation solutions, businesses are finding it extremely difficult to evaluate and make the right choice for their business needs. The right choice is not only one that makes the design, development and deployment in the most effective way, but it should also provide enough scope for application enhancements and future maintenence to be done with minimum effort. Our teams are trained to analyze and dissect your problem to the core, so that we can provide the right choice for you. Whether it is building an application from scratch and managing the entire life cycle of the application (or) enhancing/modernizing a existing legacy application, Miracle is your partner of choice. Our expertise and experience in helping enterprises make the right choices, ensures that we can help solve your critical business challenges. Miracle's Hybrid Onsite/Offshore model makes it the king in providing support services for large and medium size enterprises. Our pool of experts can help support your applications in 24/7 model at low costs and high-efficiency. We provide support in 3 major categories starting with Help Desk Services (Level 1), Combine Onsite/Offshore Team Support (Level 2) and Major Enhancements Support (Level 3). The Support model can be extended as a Fixed-Cost Support offering (or) can be a variable-cost model where resources are added flexibly on-demand. Software Quality is a key factor for the success of today’s enterprises. Miracle’s Quality Assurance and Testing Services ensure that your Application Portfolio is quality enhanced, while reusing both time-to-market and cost-of-testing. With automated testing strategies we can help in drastically reducing the testing cycles, while also enhancing the overall test quality. Our rich understanding of the Application Development process helps us to quickly understand, solve and enhance your existing applications so that your business can stay in tune with the technological advancements and provide the efficiency and output that you require. It is absolutely crucial that we are able to understand your existing architecture to be able to migrate (or) upgrade your application while maintaining reliability.